The ethmoid is really a region, rather than a bone. In any case, it is somewhat too big a bite to swallow at once. Accordingly, after a brief overview, this first pass will be restricted to one of the easier elements of the ethmoid region, the cribiform plate. The ethmoid generally is the most anterior region of the braincase. In early development, two pairs of cartilaginous rods form parallel to the notochord in the cranium: the anterior trabeculae and the posterior parachordals. At the same time, the nasal placodes are developing within the cartilaginous nasal capsules formed by invading neural crest ectoderm. This ectodermal component also contributes at least to the anterior portion of the trabeculae. In some groups, including humans and most other mammals, the entire thing congeals into an ethmoid ossification, or ethmoid plate, incorporating the nasal capsules and the anterior portion of the trabeculae. There is considerable variability on this general theme. For example, the mormyrid family of osteoglossomorph teleosts has members both with and without an ethmoid bone. Cichlids appear to have only the lateral ethmoids, which I take to be largely derived from the nasal capsules. By contrast, in eels, the fusion includes not only the elements listed above, but also the vomers and the premaxillae. See OceanLink Answers to Miscellaneous Fish Questions. In tetrapods other than mammals, the ethmoid region is not ossified at all. In general, it may be best to consider the ethmoid as containing three "bones": (a) the paired lateral ethmoids (presumably derived largely from the nasal capsules) and (b) the mesethmoid (presumably derived largely from the fused anterior ends of the trabeculae). For those with a perverse desire to see the whole thing in humans, see: II. Osteology. 5a. 6. Ethmoid bone. Gray, Henry. 1918. Anatomy of the Human Body. One relevant illustration from Gray's is reproduced as Figure 1. The ethmoid articulates with the sphenoid(s) posteriorly and frequently co-ossifies in species (fish) in which these braincase elements ossify. It typically articulates with the vomers and may co-ossify with these palatal elements as well. Other palatal articulations are possible, particularly the ascending process of the palatine. (1) the cribiform plate: a sieve-like barrier between the nasal cavity and the brain through which olfactory neurons communicate between the two chambers. (2) perpendicular plate: forms nasal septum with participation of cartilage, vomers, etc. The plate can be extremely deep, as in Homo. It splits the ethmoid in two lengthwise and descends all the to the palate, where it often articulates with the ascending processes of the vomers and palatines. (3) the crista galli: continues the perpendicular plate dorsally, above the roof of the nasal cavity where it may partially separate the two hemispheres of the brain in mammals. The crista galli and perpendicular plate can be envisioned together as a thin sheet of bone oriented straight up and down. (4) conchae (turbinals) which provide a sensory surface for olfaction and prevent water loss by recovering respiratory water. (5) orbital plates: lateral processes of the ethmoid which, if present, may define part of the medial wall of the orbits. There is a very good discussion and figures of the human ethmoid at Dept of Anth: Ethmoid Page, from which the image at left is derived. ATW 010622. The cribiform plate of the ethmoid is apparently a linguistic redundancy, since both terms refer to the sieve-like nature of the braincase at the roof of the nasal cavity. The structure seems to have been first noted by the Roman physician Galen who, like many physicians, was an acute observer but sometimes a defective reasoner. Galen believed that nasal mucous represented the drainage of excess matter from the brain through the cribiform. In fact, the flow of information is the other way. The sieve-like holes in the cribiform permit the axons of olfactory receptor neurons in the nasal mucosa to synapse directly with the mitral neurons in the olfactory bulbs. The axons of the mitral cells make up the first cranial ("olfactory") nerve. However, the olfactory bulb is somewhat more than a nerve terminus and contains a rather complex neural structure of its own. Limbic System. How the other neural inhabitants of the olfactory bulb affect the sensory function is not clear, but certainly some substantial information processing occurs even at this level. The olfactory bulb is organized into perhaps two thousand small glomeruli. According to some sources, each glomerulus is believed to be specialized around one or a few specific smells. According to another, the glomeruli are presumed to be redundant, with the response of each encoded in a sort of 24-bit binary code, corresponding to some 16 million different smells. Both explanations seem somewhat simplistic. The nasal epithelium also contains more mundane receptors sensitive to temperature and pressure. However, these do not communicate with the brain via the specialized olfactory glomeruli, but rather through the trigeminal (Vth) nerve. ATW 010622. This manifestation of the ethmoid has received considerable attention since John Ruben and co-workers argued that turbinals (to pick one of the three names by which these structures are known), or their functional equivalents, are more or less indispensable for endothermic animals. See, e.g., Ruben et al. (1997). Since non-avian dinosaurs are seem to lack ossified turbinals, or even the enlarged nasal cavities necessary to contain them, the inference was that these dinosaurs were not endothermic. Others have argued that the lack of ossified turbinals is meaningless and that the volume of the nasal cavity is larger than Ruben had supposed. Much has been written on this topic by both capable students of physiology and serious scholars of the Dinosauria. We cannot count ourselves among the number of either company. Consequently, we have nothing to contribute to this debate, although we will touch on some its parameters. The turbinals are often described as "scroll-like," although that phrase does poor justice to their complexity and variety.See image at right from Will's Skull Page (used with permission). 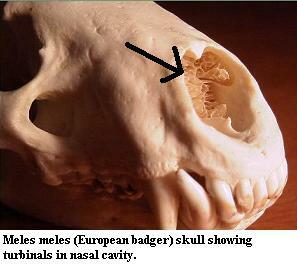 Some very high-quality images and notes on the mammalian system may be found at nasal. They are, in any event, very thin and delicate bones of great complexity. Frequently, they are not bones at all, but unossified cartilage covered with a thin sheet of epithelium. At least in mammals, turbinals come in at least two functional varieties. The ethmoturbinals are associated with the cribiform plate. They are covered with olfactory epithelium. Primarily, they serve to increase the surface area over which olfactory receptor neurons can come in contact with respiratory air. These olfactory receptor nerves then synapse with the mitral cells of the olfactory lobes through the cribiform plate in the manner described above. Some very high-quality images and notes on the mammalian system may be found at nasal. What gets all the press are the maxilloturbinals, which are located anterior and ventral to the braincase and are covered with respiratory epithelium. These turbinals are in direct contact with the bulk respiratory air, rather than the small aliquot which is shunted aside for olfaction. In mammals, the maxilloturbinals are part of a complex countercurrent scheme which adjusts for the difference in temperature and humidity between the environment and the lungs. If colder and drier outside air were allowed to penetrate directly to the lungs, it would damage the very delicate alveolar membranes. Conversely, if warm, moist air from the lungs were allowed to escape directly, this might cause a devastating loss of heat and water. These effects are not particularly serious for a large-bodied ectotherm.. Its respiratory requirements are not ambitious, and some loss of body heat is generally only inconvenient. However, the problem is severe for an endotherm, particularly a small endotherm, which must maintain a steady internal temperature and has a considerably greater demand for respiratory oxygen. The presumed function of the maxilloturbinals is thus to create a large, vascularized surface area to recover water and heat from exhalant air, and to introduce water and heat into colder inhalant air. Note that, when an animal pants, it by-passes this nasal cavity system, deliberately increasing evaporative heat loss in order to recover from temporary overheating. In the following discussion, we generally follow Wittmer 1995). This is the most recent review of a topic which has frustrated anatomists since Gegenbaur in the 1870's. The principle difficulties are two. First, it is almost impossible to determine the form or even existence of turbinals in extinct species. Turbinals are only ossified in birds and derived synapsids. Even when ossified, they are so thin and delicate that they are very rarely preserved. Second, the position of turtles is unclear. Assuming (likely, but not certain) that turtles diverged from Eureptilia after synapsids, there remains the problem of whether turtles have turbinals. Turbinals are probably an apomorphy of the Amniota. As mentioned, the problem is turtles. There are no obvious turbinals, nor is there the kind of nasal capsule in which the concha of lizards, Sphenodon or some archosaurs is found. There is, however, the laterale Grenzfelte, a laminar protuberance from the wall of the nasal capsule which seems very similar to the rostral concha of Sphenodon. These structures may be related. However, Wittmer finds nothing particularly close in any other living taxon. What Wittmer does find is a very close and convincing homology between the conchae (turbinals, cristae, etc.) marked in red in the figures adapted from his review. That is concha of lizards, the caudal concha of tuataras and birds, the crista semicircularis of mammals, and the concha plus preconcha of crocodilians are all the same structure. For convenience, we will follow Wittmer and refer to this structure as the "primary concha." In order to follow the argument, we will need to look more deeply than usual into the fundamental issue of homology. In drawing this conclusion, Wittmer sticks very close to the strict Patterson formalism for homology. That is, in order to be homologous, structures must satisfy the tests of similarity, congruence and conjunction. These tests can be summarized as follows: Similarity: Each homologue must have the same 1:1 topographical relationship with other structures. In practice, we may add "or a really good developmental explanation of why it differs." Congruence: The presence of the homologous character must be congruent with the cladogram. That is, the homolology must be a synapomorphy of some clade. Conjunction: If two structures are homologous, then both can never appear in the same organism. This is, obviously, a rather strict definition, perhaps too strict in some respects. However, the primary concha generally satisfies these tests. In particular, the primary concha forms at or near the juncture of two major nasal cartilages (the paranasal and parietotectal); is the first conchal structure to form in development; is situated directly opposite the choana or its homologues (it starts and has its roots here in crocs); has a fixed relationship to the ophthalmic nerve; and contacts the lacrimal where present. In most cases, it also forms a capsular structure, the cavum conchae. Turtles present a problem for the congruence test which cannot be completely resolved. However, the general constriction of the nasal cavity in turtles probably results in secondary loss of the concha. The problem with Wittmer's hypothesis -- and its only a small problem -- is really in the conjunction test. He essentially ignores this aspect of the equation and therein may have missed the forest for the trees. The fact is that there are a bunch of conchae in several derived forms. Even Sphenodon has two. Birds and crocs have three, and mammals may have six, or perhaps more. Significantly, as Wittmer notes, the primary concha in crocodilians splits into two parts during development, forming the concha and the pre-concha. Both in archosaurs and mammals, all of the conchae are structured in a similar way. Furthermore, when a particular species has conchae which are of a distinct form, it appears (from a very cursory review of a limited sample) that all of the conchae in that species have the same aberration. So, its possible that a "concha" is not so much a particular structure as a rather general genetic program that can be duplicated and may operate at many points along the ethmoid and nasal capsule derivatives. This actually takes very little away from Wittmer's main argument. The similarities of the primary concha across many taxa are too strong to ignore. But, at the same time, we cannot fairly conclude that the other conchae are "neomorphs." The concha program may simply have been expressed more than once. In one case, the turtles, it may have been expressed only once, but not in the usual place. That is, it may be that the concha program has been activated in the laterale Grenzfelte, instead of the usual position. We see that both can also happen in Sphenodon. We might conclude that there is a fairly broad area, perhaps the entire ethmoid plus nasal capsule region, in which the concha program may be activated, with the most probable location being the primary concha. Thus, this supposition has at least a bit more explanatory power than simple homology. However, it is virtually impossible to test without the techniques of genetic manipulation. Unfortunately, it may be some time before we have available "knock-out" turtles or crocodiles. In the mean time, strict homology is probably the best bet, so long as we don't take it too seriously. ATW021026. A similar anatomical belief seems implicit in the writings of another noted authority, Mick Jagger.